Meet our current favorite breakfast treat. We have been smoking a lot of trout lately, and while it is fantastic all by itself, we enjoy it even more after it has been sitting in olive oil for a few days. 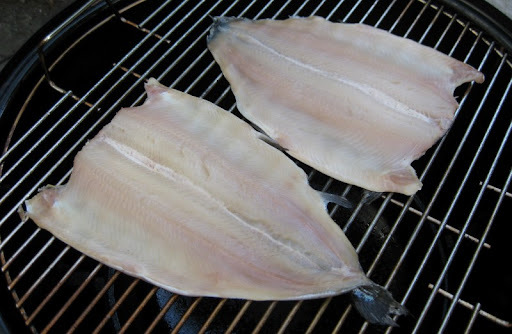 The oil takes on the smokey/salty character of the fish to give it a great flavor. 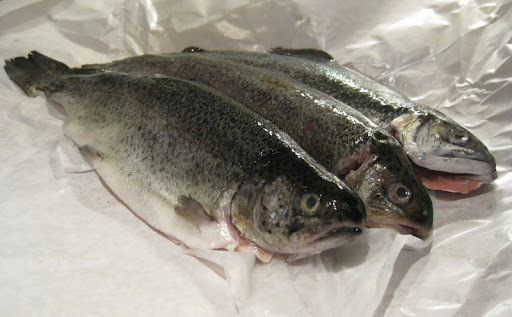 Lately, we've been buying our trout from El Pescador in La Jolla. We have been very pleased with the quality of their fish. 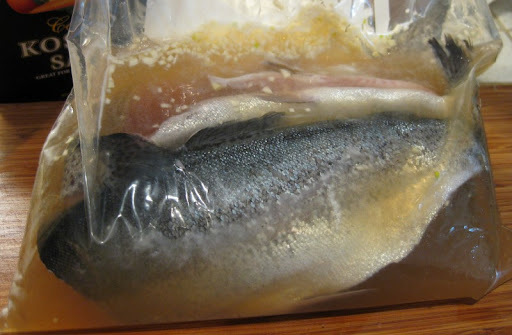 After removing the heads, we season the trout with a quick brine. 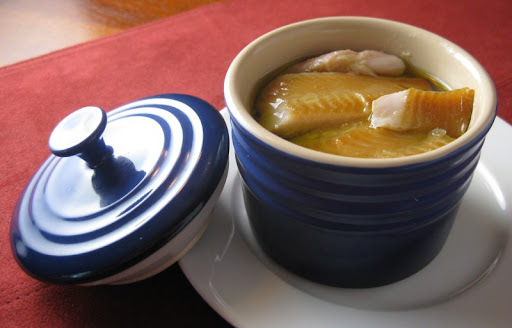 For three fish we use 3 cups cold water, 6 tablespoons kosher salt, 3 tablespoons brown sugar, 1 1/2 tablespoons lemon juice, 3 minced garlic clove and a large pinch of allspice mixed up in a plastic bag. After a 60 minute soak, we rinse them off and let them dry on a rack overnight in the refrigerator. The next day it's on to the smoker for about three hours at a gentle 150-180 degrees over apple and oak. And this is what they look like when they're done. Once the fillets have cooled, we peel off the skin and pack the flesh into small mason jars, along with with plenty of extra virgin olive oil. Since we don't do a heat processing step, these aren't really "preserved" so we only make 3 or 4 jars at a time and store them chilled. 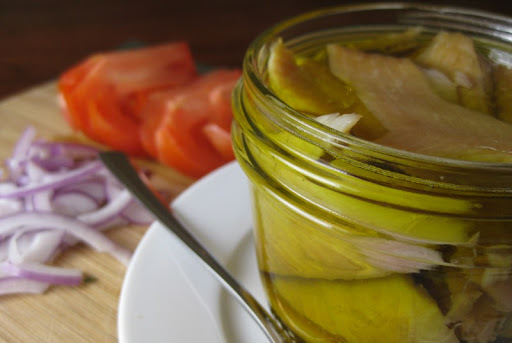 When we're in the mood for some smoked trout for breakfast, we just grab a jar out of the fridge. A quick zap in the microwave (on low power - otherwise the olive oil freaks out) is all it takes to make it nice and warm and aromatic. 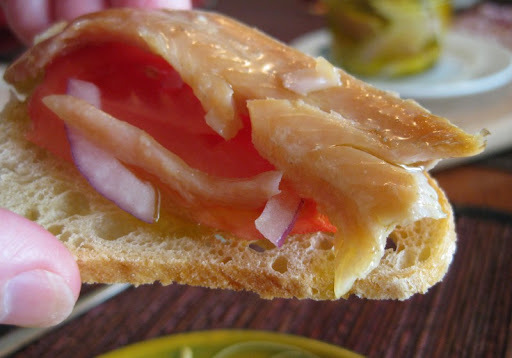 We like to have it on crackers or thin slices of bread, along with some red onion and tomato. That looks incredibly good. Those trout just look impeccable. So a friend sent me an email a couple of weeks ago that said: "Do you know these folks? If not, you need to track them down & make friends. Seriously, they’re your missing twins. (link to your blog)"
Then we saw a picture of a Waffle House in Lexington, Kentucky that was about 2 miles from where I used to live (having moved to San Diego in 2001). So I thought I'd say hi. Definitely give cheese making a try. We just recently started, and have made a couple of simple cheeses - a fresh, "cream-cheese" like cheese and a queso fresco. Fun stuff - we'll likely do some cheese posts once we're closer to knowing what we're doing. Nice trout! I'm having a tough time finding high-quality trout these days...lots of sunken eyes. We're lucky to have a good fish market near-by, but I wish we could get just-caught trout (or shad!) instead. Thanks for the canning tip. I was under the impression that you needed to pressure-can low-acid things like fish... I'll have to investigate further. Mike, I *love* your blog. Wish I'd found it sooner. I've favorited it and am planning on spending the next few days exploring it. Thanks for this recipe. 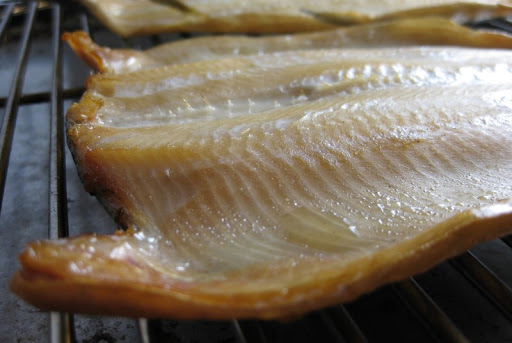 I adore smoked trout. Hi Leela - thanks for coming by! I stumbled across your recipe for steamed buns the other day and we definitely plan to try making them. I am sold for this recipe since i saw the title. I come from a small city close to the mountains in Romania, and trout was our local fish. We even had it at our wedding, but this smoked one looks amazing. maybe i can find a way to smoke it somehow inside?!?! still no chance for a smoker.